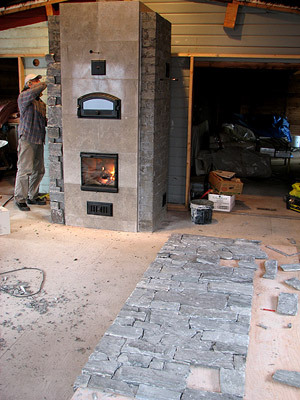 Time and money saving tips for achieving "dry-laid" look for real stone heater facing. 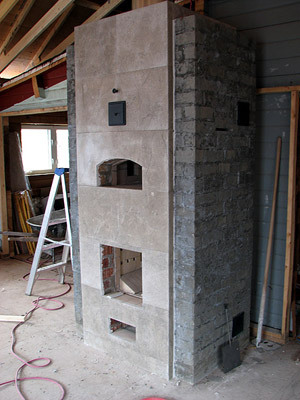 Look of "dry-laid" stonework on a masonry heater is one of the most admired and sought after. This type of stonework, however, is the most demanding and time consuming for a mason and therefore, is one of the most expensive for the client. This short article shares some tips and ideas proven by experience to make such look more affordable. 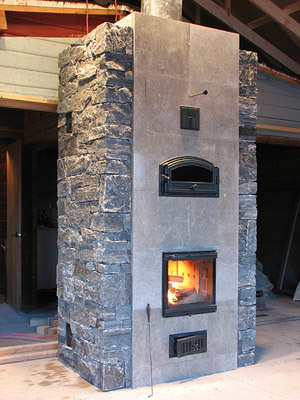 Cost of "dry-laid" look stonework for facing of a masonry heater using full-dimension stone can be as high as $100-200 per sq ft depending on type and size of the stones desired, heater's shape and amount of available stone to choose from. Cost of such stonework is so high for the reason that unless a selected type of stone offers very even flat bed surface and there are lots of stones of different size to choose from, each individual stone has to be extensively hand trimmed and grinded to create those appealing almost non-existing thin joints of the dry-laid look. High labor cost for such work on a heater's facing is also a result of the fact that any masonry heater has numerous openings and corners -areas that require precise trimming and cutting - with almost no "free-running" areas to get some square footage done fast. In such situation, use of natural thin stone veneer is the choice that makes such look more affordable. Thin stone veneer should be applied over a rough masonry facing that, depending on specific requirements, can be done in either concrete block, clay brick, and concrete brick or firebrick laid as shiners (more about "shinerology" using firebrick is in this article by William Davenport). In case of bricks laid as shiners (on their long edge), it is cheaper to use straight and square concrete bricks laid in high-quality thin set tile mortar, than to use more expensive firebrick. 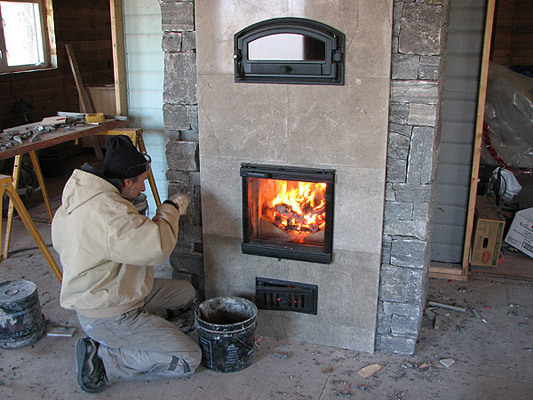 As an example for such technique, here is a heater, faced with limestone tile and natural thin "Corinthian Granite" veneer from Champlain Stone, applied over rough clay brick facing with high-quality gray thin set mortar. First, multicolored cheap back-up brick is laid to create a necessary shape, than the brick gets brushed with runny mixture of dark gray or black thin set to get rid of colors shining through the joints between stones. For much faster stone fitting and cutting, mock-up corner and face is made from plywood and 2x6 lumber for each side. Openings are marked at their exact locations. This technique allows starting with corners, placing all corner stones strategically and making sure all works together for corners. Then, it is much easier and faster to select and trim stones on the flat horizontal surface. Don't trim the top line or stones around openings yet as most likely the stones will shift a bit on vertical surface from prearranged position and you will need to adjust your lines a bit. Sergei is applying stones on the left hand side, while I am getting another side ready. Finished side is then applied fast in the proper order. Stones adjacent to openings are trimmed on the go. Stones for the other side of the corners are selected and trimmed the last. Seregei is working on the remaining stones in the front face, while heater is being fired for curing and to provide some heat to freezing masons. For this heater, this technique allowed me to prepare stones for two complete sides in two days only. Installation and fitting of the missing stones at the front took another 1.5 days: Sergei, my apprentice, could start applying stones in selected order for one side right after one side was ready, while I was working on fitting stones for another side. After finishing fitting the stones for another side, I've joined him applying the stones and trimming the remaining at the front. Such technique for pre-cutting stones and fitting them on a flat surface can be used to save time and money. Prepared face can be applied by a less-skilled worker while stone mason's time is used most efficiently. Such facing can even be prepared in a home shop and transferred to the job site in order for the fast application. 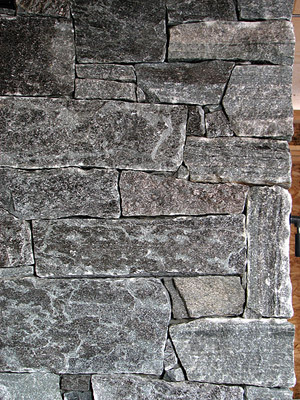 Using thin stone veneer reduces time for stone trimming dramatically, and therefore saves money for the client. 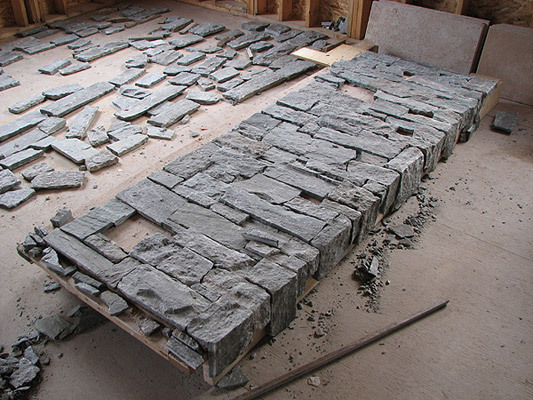 The result work will look just as full-depth stone work if enough care is taken to fit stones properly and neatly. And the last tip: combining materials, such as stone tile and rough stone veneer in this heater's facing, allows to reduce amount of stone veneer, and therefore lowers the overall cost, while making the facing more interesting. We have used such technique quite a lot, creating appealing and not-so-expensive heaters combining brick and stone, stucco and stone, or tile and stone. Check some of the projects out at our Gallery.